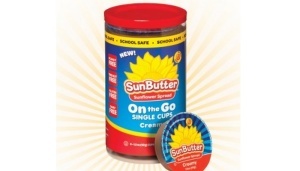 Target and SunButter are teaming up to give out free SunButter peanut butter samples. These are samples of the single serve peanut butter containers. Single serve containers can be very handy. I’ve used these to dip crackers in for either me or the kids. Really they are good for any fast meal or snack on the go. It can also be nice because you can put the peanut butter on a sandwich fresh. This is also SunButter peanut butter so it is very good quality peanut butter. This is also a Target sample so hurry in because these tend to go quickly.